What will President Trump’s enduring legacy be years, possibly decades, after he’s left office? Many Americans might point to his draconian handling of immigration. Others might cite the Russia investigation, or perhaps his nominations to the U.S. Supreme Court. While we’re less than halfway into Trump’s presidential term, there’s already something few can deny: His handling — or, rather, mishandling — of natural disasters has been deeply costly, in terms of human lives, property damage and ecosystem health. Clearly, no one would blame the president for the disasters themselves, but Trump has taken direct actions in the aftermath of each incident that can easily be described as negligent — if not downright counterproductive. The most recent example is President Trump’s response to the California wildfires, the worst in the state’s history. Officials estimate that at least 85 people died in the Camp and Woolsey Fires, which are now fortunately contained. Rescue workers are in the process of surveying the damage and looking for victims of the blaze, as there are still a number of individuals unaccounted for. 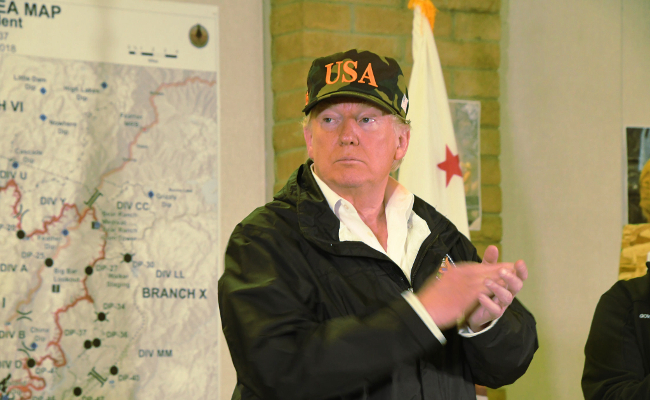 Nearly two weeks ago, Trump went to California to pose for photographs in areas devastated by the fires, while offering commentary on how “nobody thought this could happen” and declaring that this disaster was the result of forest management failure — going to far as to falsely cite Finland’s fire prevention tactics of “raking” their forests. Trump has established not only a pattern of making unnecessary statements in the wake of natural disasters, but also undermining preventive and recovery efforts. The California fires came as Trump ordered the deployment of thousands of troops to the Mexico border to “defend” the United States from an “invasion” of impoverished Latino families — troops that could and absolutely should have been aiding disaster response efforts in California. Instead of using this manpower to combat the fires and to aid in evacuations, Trump prioritized a political stunt – arguably at the cost of human lives and millions of dollars of property. It’s not just California, though. After last year’s Hurricane Maria thrashed Puerto Rico, Trump quickly engaged in a feud with its governor, lamenting the recovery effort’s cost to taxpayers and threatening to withdraw FEMA – not even a month after the fact. Apparently Maria was not a wake-up call, however. The Trump administration later reallocated $9.8 million of FEMA’s budget to help fund ICE’s growing use of immigrant detention facilities and deportations not long before North and South Carolina were struck by Hurricane Florence. The official death toll in North Carolina alone, as a result of Florence, sits at over 40 — with at least two being suicides by homeowners financially devastated by the storm. With more than two years remaining of the Trump presidency, there’s little doubt that there will be more natural disasters in the near future. However, because such events can’t be belittled with a terse tweet or harangued at a rally, they do not interest him – and, as a result, communities will spend years recovering. I would probably upgrade that ,to murderer of the planet .that could be is legacy . TrumpCo is a disaster for the environment that is accelerating climate change worldwide, as recent indicators show. Nope--it'll be his stance on climate change...plus what will undoubtedly be a record for criminal indictments, nepotism and general hatred.